When I took over the position as Music Director of the Scottsdale Baroque Orchestra, I began looking at ways to reenergize their programing. For the most part, the ensemble been playing the standard baroque-classical repertoire for it’s entire existence. In the Phoenix area, as is true in many areas, this was a hard sell. It even limited the pool of players interested in performing with the ensemble. 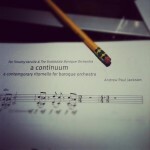 As I was working on programing 2011-2012 season, I thought it would interesting to have the ensemble premiere a new piece of music, to shake up the routine a bit. As a way of linking the past and present, we would commission a modern dance suite based on baroque ideas. Instead of just haphazardly tossing this new work onto a program of Handel and his friends, I decided to modify the programing to present an alternate version of the history of classical music. Skipping the textbook rewrite, I searched for something catchier, something with a different approach. I will admit, I have a slight affinity for puns and wordplay. 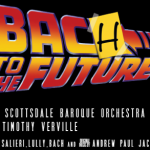 So I couldn’t pass up the opportunity to title a concert Bach to the Future. This phrase has been used for quite some time by other ensembles, so the parody had been established. But in all previous instances, I had never seen it utilized as a programatic tool. Rather, it was typically employed as a title with no real connection to the concert except that there was music by J.S. Bach being performed. As a programatic tool, the concert would demonstrate what would happen to the timeline if minor alterations were made, similar to situations in the movie (you know, Back to the Future” for those of you who still didn’t get it.) Musically, this lead to four scenarios which setup the music for the program. From these scenarios, four guiding questions were asked. What if Mozart had given up music to become a candlemaker? To answer this question, we began with Salieri’s Sinfonia Veneziana, showing who could possibly be the new representative of this time period. Antonio Salieri was one of the most popular composers in Vienna during Mozart’s life. His fame was posthumously eclipsed by Mozart and with the exception of a few operas and other miscellaneous instrumental works, he resides in the waste bin of musical history. Arguably, some would say this is where he belongs. Others who are less informed would say it serves him right for killing Mozart (speaking of another great 80’s fictional movie.) All of this aside, the short eleven minute symphony was was the most standard/traditional piece on the concert and provided the basis for our jumping off point into our historical rewrite. What if the violin wasn’t the most popular instrument during the mid-1700’s? 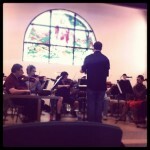 For this, I enlisted the help of a local percussionist to perform Bach’s Violin Concerto in a minor on marimba. Why marimba? Why not! Actually, it made sense for several reasons. The first was the tie in with the keyboard instrument and Bach (fairly self explanatory.) The second was the popularity of this work with other marimba players around the world who have co-opted it into their solo repertoire. Lastly, and most importantly, I liked the ability to explore the different colors that became available between the orchestra and the marimba during the concerto. It pushed the players to move “out of the box” of the standard way of playing music from that period and adapt to a new way of thinking about accompaniment. It created new characters and introduced fresh approach to the piece. This new look helped make it one of the player and audience favorites from the concert. What if Baroque dance suites were still en vogue today? To answer this question, I enlisted the aid of Boston-based composer Andrew Paul Jackson. Having attended graduate school with Andrew and conducted his opera Grigori Efimovich: The Memory of Liars a few years ago, I was familiar with his work. I called him up and asked if he would write a dance suite using baroque characteristics in a modern language, following a similar idea of Prokofiev’s Classical Symphony or the neoclassical works of Stravinsky. After a few moments of silence which was then followed by some persuasion on my part, he agreed. He had never written anything like what I was was asking for but I felt he was up to the challenge. And I was right. What would a Baroque composer do with a Romantic orchestra? Felix Mottl, an Austrian conductor from the late 1800’s, created two separate ballet suites based on the music of Rameau and Lully. For the concert, I chose the suite on Lully’s music which was massaged into a four movement work in symphonic form. Mottl transcribed the music for an orchestra consisting of double winds, trumpets, horns, strings, and percussion. This provided the perfect opportunity to try an experiment of combining the performance practice techniques of the 17th and 19th centuries. This synthesis included free ornamentation (to which our principal trumpet contributed greatly), varying amounts of vibrato, portamentos, trills, glissandi, turns, and other effects from each period. While the audience might not have caught the intricacies of the two stylistically different periods represented in the music, the performers enjoyed being able to do something creative with the performance. Regrettably, the only thing missing from this concert was the DeLorean Time Machine. A replica was sought (because we all know the real flying DeLorean time machine was destroyed at the end of the third movie) but the gentleman who owned one locally would not agree to a reasonable fee for its appearance. Regardless, the end result was a wonderfully cohesive program of quality music making which included well known music, lesser known composers, and a world premiere. The feedback from the audience afterwards solidified this as the most enjoyed program of the season and generated large amounts of enthusiasm for upcoming performances. Do you have or know of a creative program? Email it to me or use the comment box below and I’ll share it in a future post.